I left for lunch today and went to my little picnic area at the end of another parking lot nearby. I had planned on an activity, but forgot a component necessary, so that was nullified – more on that another day. I’m still not feeling like exerting myself on a walk and it is bit north of breezy, almost on the windy scale, so I just parked under one of the trees and decided to rest inside the car. I was enjoying some quiet time that allows for the settlement of the noise that gets carried out the door with me when I exit the building. 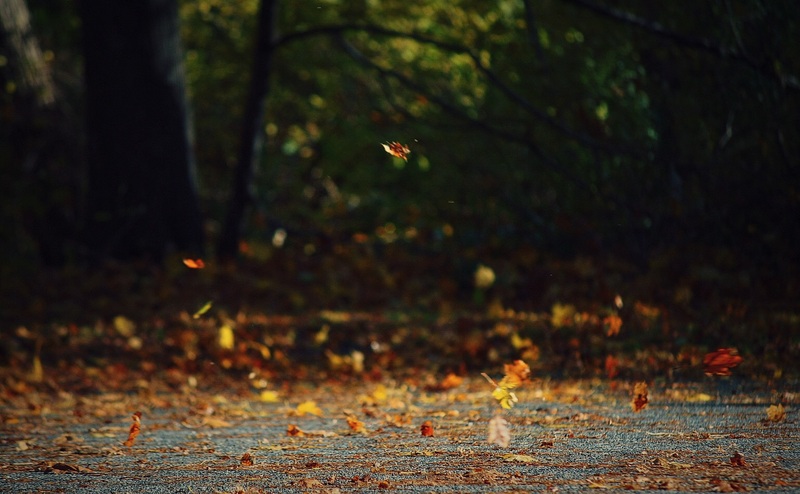 Pretty soon, the chatter inside my head was replaced with the flutter of the leaves above. 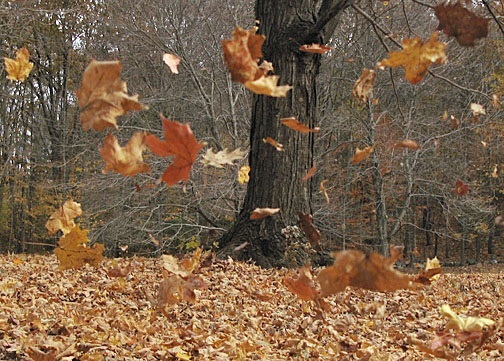 It’s then that the wind howls at me to look around and see the leaves being blown across the parking lot. I realize that with each gust, they look to be running, skipping and chasing the group in front of them. It makes me smile. And then there are those still on the tree, cheering as they clap together for those racing on the ground. Some get so excited that they let go of the security of the branch they have clung to all summer just so they can join in. A few come straight down, but there are those that make it a competition on how far they can surf that next wind current away from the tree. The next thing I know, I have my phone out and I’m typing up what a great lunch I’m having with just the leaves and wind as my companions, hoping it makes someone else smile as well. We spent our lunch hours doing the same thing albeit mine was in a parking area looking over a lake near Riverside Gardens. The leaves were phenomenal and the rain was bringing them down slowly but surely as I found out when I got home. Our yard was once again covered even though Uncle Roy had mowed them all up just the day before. A truly beautiful fall! Well then, I know you enjoyed yours as well! Fall in Ohio is wonderful. 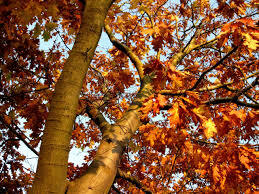 The leaves: watch, rake, move, mow, mulch; repeat. The sky: cloudless blue; clouded gray; sunset streaked. The mornings: misty and brisk. The nights: early and cold. The days: never long enough.